My first City promotion season was 1970/1, that side developed under Tom Johnston, was to earn us promotion to Division 2 (one flight below the top division) in 1974. After years of encounters with the likes of Workington, Hartlepools and Rochdale, we had climbed out of the bottom 2 divisions. The team, resplendent in our unique new maroon Y-fronts (with logo designed by ex City junior Peter Turpin), one of the many innovations of Keith Hunt, our new Commercial Manager, could look forward to Manchester United, Aston Villa, Sunderland, Fulham and Norwich. United, newly relegated; Sunderland, just a year after their memorable FA Cup Final shock win over Leeds and Fulham, captained by Bobby Moore, our 1966 World Cup winning captain were just some of the sides we were were facing for the first time in league football. So did Aston Villa, West Bromwich Albion, Nottingham Forest and Sheffield Wednesday. Add in the likes of Southampton, Portsmouth, Bolton and Blackpool, teams with recent top flight experience and City seemed to have a mountain to climb just to survive. We were to finish 15th in Division 2. Our Division 3 success had been built on a rock solid defence, experience and skill in midfield and 2 strikers who'd come together to form an effective strike force. Together, an efficient, workmanlike side. Tom Johnston approached the challenge in his usual way. 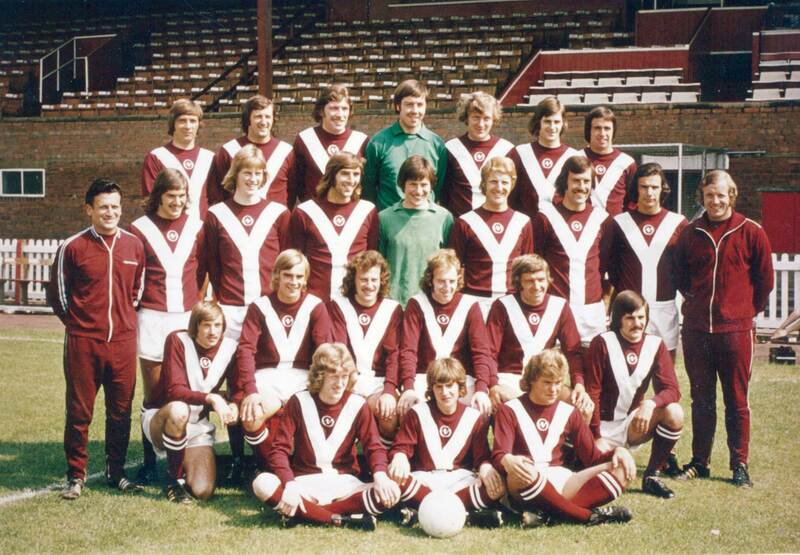 Proven, lower league performers including Mickey Cave and Jim Hinch who’d played well against us in the previous season and Peter Oliver, a free transfer left back from Hearts replacing Phil Burrows our departing left back and first ever player of the season. Could we survive against the big boys? Expectations were modest. We started the season with 1-1 home draw against Aston Villa. Fuelled by away wins at Fulham and OLdham, we surpassed ourselves as we hit 5th place in mid October. A month later, reality set in. We were thumped 3-0 by Sheffield Wednesday, our defence, previously so assured, was run ragged, the midfield showed its age and the attack was blunt (the dodgy keeper was to still yet to come as the defence was to become increasingly porous). An injury crisis saw us slump back from the fringes of the promotion race. Watching from high up in the gods at Hillsbrough, on the top tier of a double decker stand (at the time, a regular FA Cup semi final venue), the players seemed like midgets. It wasn't as exciting as standing right behind the goal at Bootham Crescent. 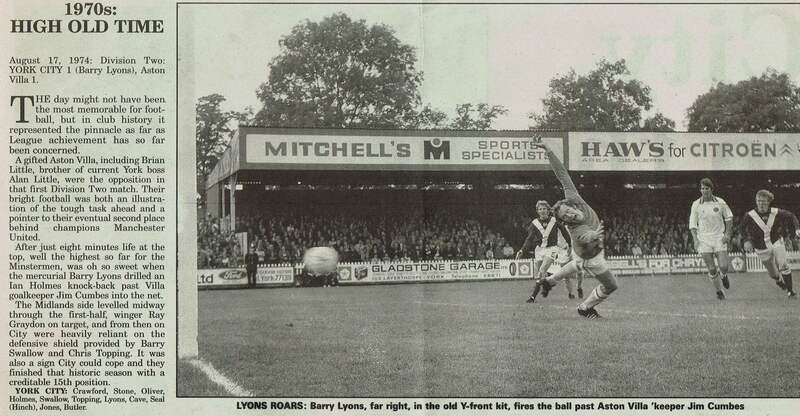 We muddled along and could sometimes raise our game on the day as demonstrated by an inspired 1-0 win over Norwich who were to gain promotion that season. A game remembered as Yorkshire TV could only show first half highlights as darkness descended and our floodlights were too weak to allow filming to continue after half time. Manchester United visited Bootham Crescent just before Christmas and won 1-0, probably the easiest 1-0 I've ever seen. That game was scheduled for Match Of The Day, but the BBC pulled out after the Norwich game due to the quality of the floodlights. We drew 1-1 at Arsenal in the FA Cup after a glorious long range shot from Jimmy Seal gave us the lead (City fans £2 paid to sit or £1 to stand in The East Stand at Highbury). City lost 3-1 in the replay after extra time. The games stand out for 3 reasons. The Jimmy Seal goal, a day after the Highbury game, news broke that Tom Johnstone, our dour and canny (sic) Scottish manager was to resign in order to secure his financial future as Huddersfield's new General Manager. The replay defeat being memorable for a swift Arsenal counter attack that caught Graeme Crawford out of position. To this day, I swear he was getting fresh chewing gum out of his kit bag as Arsenal broke forward. Another memorable win was against Fulham (thus completing the double) where a young Brian Pollard rang rings around the Bobby Moore / Alan Mullery defensive axis. 6 weeks later Fulham graced the FA Cup Final. Around this time, with football hooliganism rife, and home support often heavily outnumbered by our visitors, the club decided to move the home supporters to the opposite end of the ground (where we remain, in ever diminishing numbers to this day). I knew then that, we, the supporters, were just another commodity. Wilf McGuinness, our new manager, whose previous managerial post in England had been as a short lived successor to Sir Matt Busby at Manchester United, saw us safely to the end of the season. Relegation was never a real possibility but our status wasn't confirmed until the penultimate game of the season. We finished 15th. Chris Topping was voted Clubman Of The Year and together with captain Barry Swallow formed an effective central defensive partnership. Behind them, Graeme Crawford was once again an assured keeper. In midfield, Holmes and Pollard provided the flair whilst veterans Lyons and Butler together with record signing Mickey Cave provided the guile. Up front, the Seal / Jones partnership once again held its own. Our cultured football, with Lyons, Butler and Holmes prominent saw many plaudits heaped on “Little York”. Of the regular line up, only Lyons and Butler had any real prior experience at this level and the footballing world was genuinely surprised that York adapted so well. The era also marked the pinnacle of my playing days. I reached the dizzy heights of pulling on the school's 2nd XI shirt. Watching a successful side, my goalscoring prowess was based on that of Jimmy Seal and his partner, Chris Jones. Whilst from midfield, elements of the pace of Brian Pollard and the passing prowess of Barry Lyons added to my all round game. Unfortunately, Swallow, Lyons and Butler were at the veteran stage and many of the younger players were unable to sustain their performance into the following season. Indeed, only Pollard was to play at this level after leaving York. For York, good teams come together about every decade. As the promoted side, which had cost barely £40,000 to assemble, grew old together and broke up, we couldn't find (or afford) adequate replacements. McGuinness' plan to bring ex Manchester United players to York failed to reap reward. 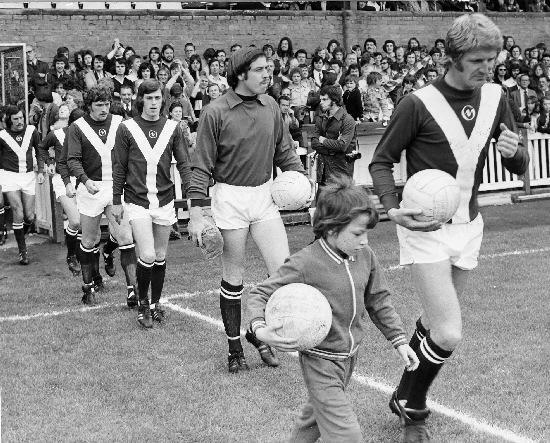 The home grown spirit which had taken us so far was crushed as he sought to bring Old Trafford to Bootham Crescent. We suffered relegation in each of the following 2 seasons and flirted with bankruptcy whilst going cap in hand to The Football League as we once again had to apply for re-election in 1978. We remained in Division 4 until our 1983/4 record breaking Championship season when it all came together again. Check out film coverage of several of these games.